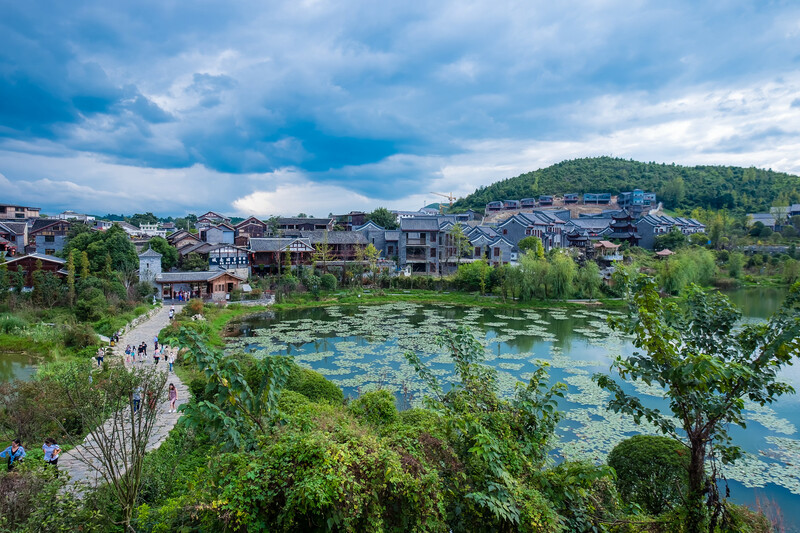 Located at an altitude of 1,100 meters above sea level on the Yunnan–Guizhou Plateau is the scenic city of Guiyang. 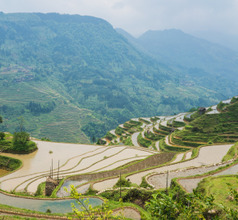 It is situated in the center of the Guizhou Province of China on the northern banks of the Nanming River, a tributary of the Wu River. The city’s proximity to colorful karst caves and rock formations is an additional asset as far as tourism is concerned. 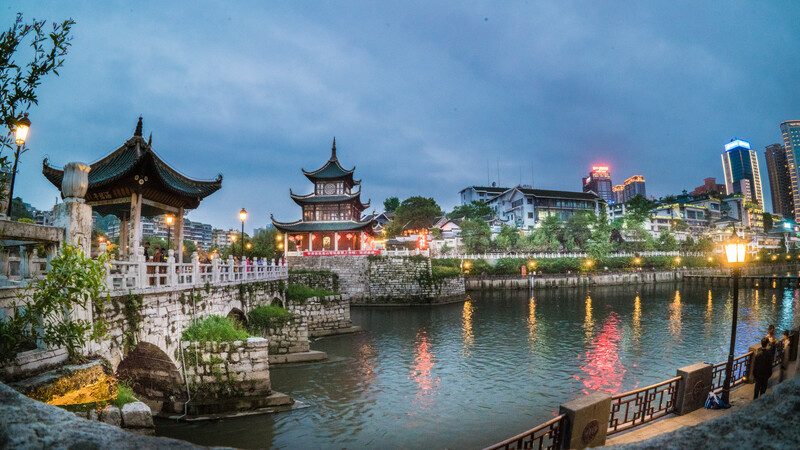 The reason why Guiyang City has become a popular tourist destination is not only the picturesque landscape but also its colorful culture. 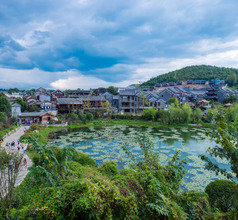 The city is home to 30 ethnic minority groups or more, of which the Miao, Dong, Buyi, and Hui have a prominent presence. Each group follows its own customs, traditions, and religious practices that have been followed since ancient times, making the city a very interesting blend of ethnicities. 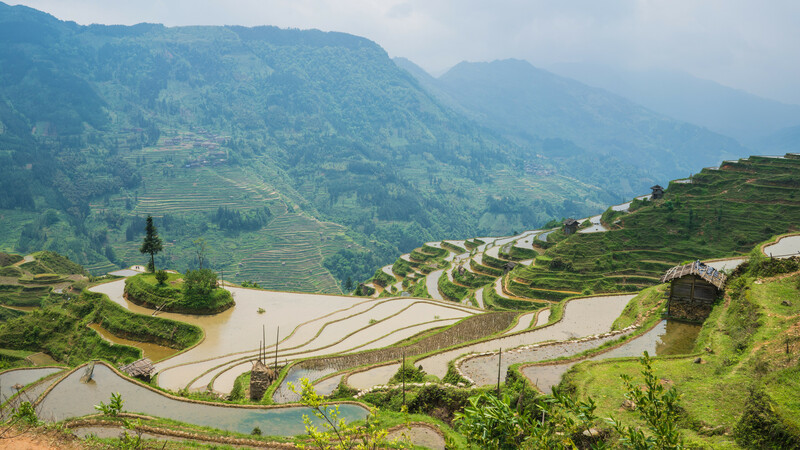 The Guizhou Provincial Museum located in Guiyang City is proof that there were early human settlements in the region prior to China’s imperial reign. The museum is spread over 7,800 square meters area and has more than 200,000 ancient relics like fossils, weapons, pictures, handicrafts, models, and more. 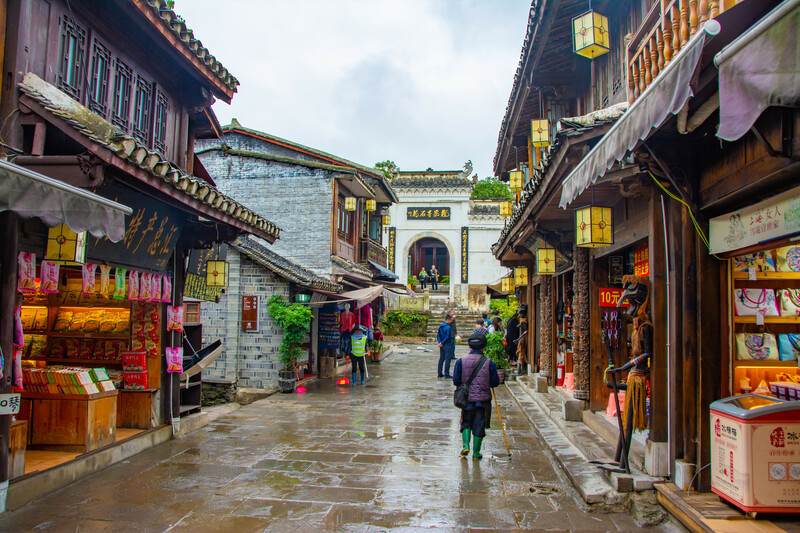 The city was a military stronghold during the Sui and Tang Dynasties in the 7th century. It rose into prominence during the Ming and Qing Dynastic eras when it became a prosperous prefecture-level city. 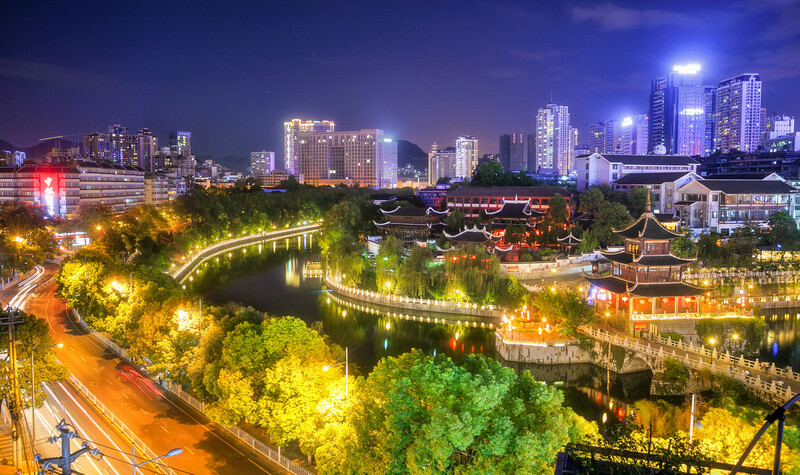 Compulsive shoppers will love visiting Guiyang City. Its markets are a treasure filled with little shops selling the most exquisite souvenirs. One can get Maotai Liquor, Anshun batik prints (fabric, stoles, bags, purses, accessories), Guiding Yunwu tea, flutes, ethnic silver jewelry and showpieces, embroidered handicrafts and fabrics, exotic fossil stones, etc. The Tourism Souvenirs Business Department is an outlet where one can get a large variety of local handmade souvenirs. The nightlife is plentiful in the city. 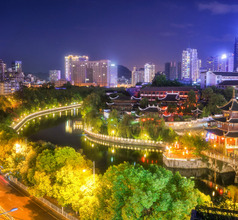 Cinemas, bowling rooms, bars, clubs, cafés, and teahouses are dotted all over Guiyang. At night, there is a wonderful folk performance in the Yangming Ancestral Temple. 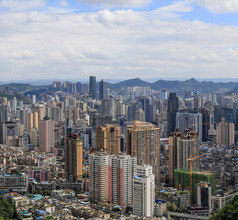 For accommodation, Guiyang City offers 2, 3, 4, 5-star hotels, inns, apartments of various sizes, guesthouses, youth hostels. The star hotels provide spacious rooms and numerous amenities like International-style in-house restaurants, housekeeping, laundry, customized sightseeing, etc. The cheaper options are great for those who are traveling on a limited budget. Being a well-developed city, the hotels are clean and comfortable. 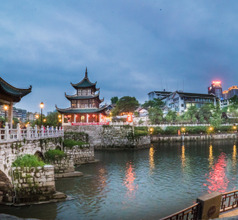 Guiyang City has several scenic and ancient historical relics that both domestic and overseas tourists love to visit. The most popular attraction in the region is the Qianling Park. This is a typical city-style park where families with kids will really enjoy. The park has bold wild monkeys who are accustomed to tourists. The perimeter of the park is lined with numerous stalls selling locally made handicrafts and delicious snacks. The park also has an amusement and recreational area, a zoo, and a tea garden. The Hongfu Temple on top of a hill in Qianling Park offers a splendid panoramic view of the city below. Built during the early Qing Dynasty reign, this monastery has aesthetically designed ornamented roofs and eaves. The temple contains several large deities, a pond teeming with carp fish, a wishing well, a large bell for ringing, souvenir shops, and restaurants. There is a cable car service up to the temple. The Huaxi Park (Flower Stream Park) is part of a larger tourist attraction called the Flower Stream Scenic Area. This attraction is a charming blend of natural hills and valleys, meandering rivers, and ethnic relics, making it a very popular tourist spot. 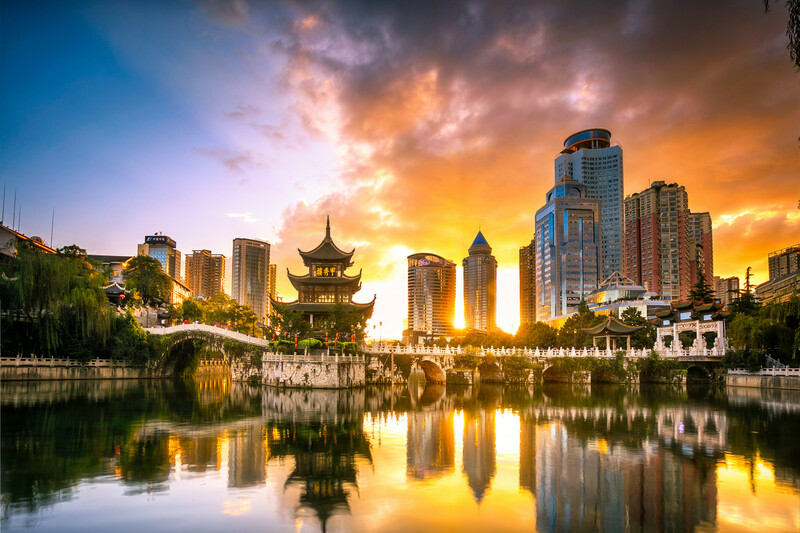 Also known as the “back garden of Guiyang City”, the park has superb natural landscapes. It houses the cultural center of the Bouyei ethnic minority group and ancient paper workshops. The public is allowed to set up a BBQ apparatus and enjoy a picnic in the park. The Nanjiang Grand Canyon, located about 54Kms from Guiyang City is a site that should not be missed. It consists of bright and colorful karst landscapes, 40 waterfalls, and many species of flora and faunae. Another similar site is the South River Grand Canyon. The canyon has a span of over 40Kms and a depth of 390 meters and consists of magnificent karst cliffs, waterfalls, valleys, and steep peaks, etc. The canyons have cable car services that will provide a panoramic view of the scenery. 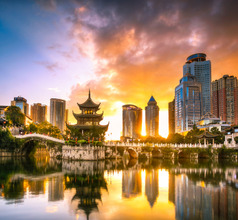 Guiyang in Guizhou province, has the Guiyang Longdongbao International Airport which is well connected to all parts of China and has international traffic from many Asian countries. 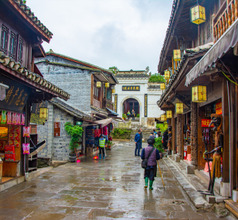 It is 11kms to the east of town center and is connected extensively via shuttle bus (around RMB20 depending on route), city bus (under RMB2.5), train from terminal 2’s Gate 11 in domestic arrivals (RMB8.5) and taxi, expensive but convenient (takes 35 minutes), ranging from RMB30 to 120. Like the rest of the province, the people of Guiyang City like spicy food. They make liberal use of whole red chilies or red chili powder in their dishes. But the chefs in the city are mindful of differing tastes so they can prepare the same dishes with less or no chili. Some of the popular local delicacies are Changwang noodles, Siwawa (shredded vegetable wraps), spicy and sour sticky rice, etc.